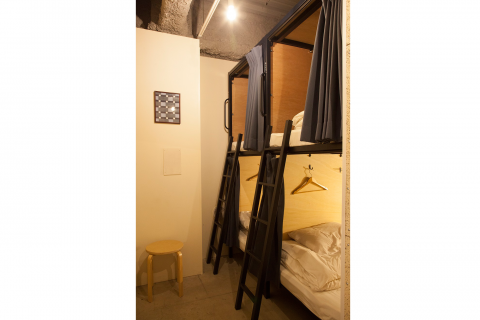 Clean and functional dormitory beds and semi-private rooms will provide you a convenient and comfortable stay. We provide reasonable and clean rooms where you can stay comfortably. 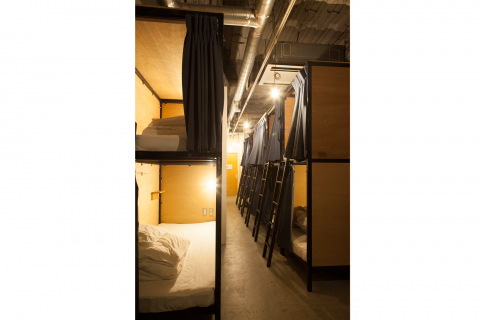 We have mixed and female dormitories. 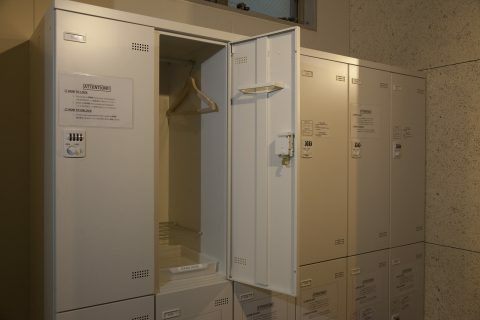 We have lockers in the dormitories to keep your belongings such as laptops and wallets in. They are number-combination lockers, so you won’t need to bring any padlocks! The female shower rooms are on the 2nd floor and male shower rooms are on the 5th floor. We have a coin laundry and mini kitchen. 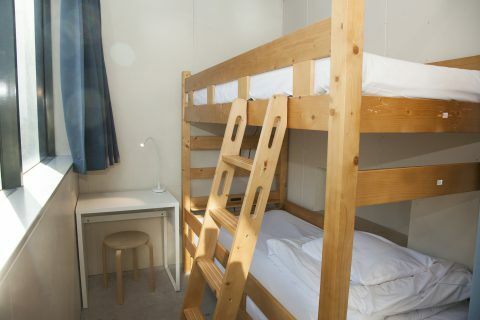 This is a mixed dormitory where you can stay at the most affordable price. It has been designed a private and comfortable space. This is a female dormitory where you can stay at the most affordable price. 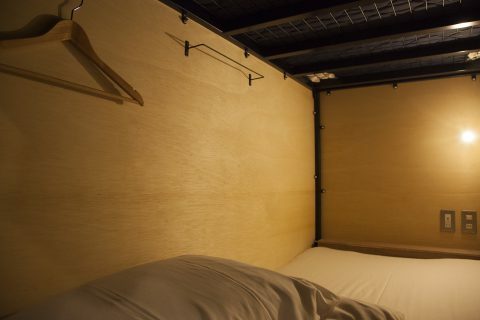 It has been designed a private and comforablespace. This room is in a mixed dormitory. Room is separated by walls and curtain so you can spend your time without worrying other guests. 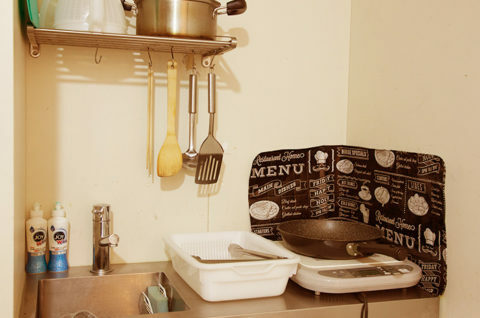 You can use our small, functional kitchen for 24 hours. There is a freezer, microwave, kettle, knives, and forks. There are some seasonings and tea you can use for free. 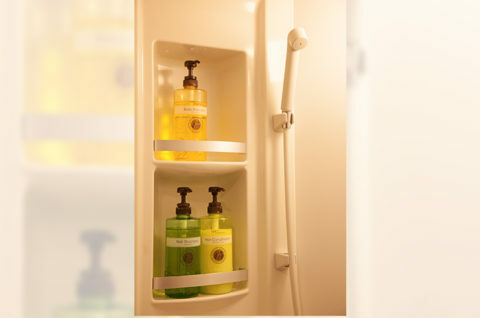 The shower room is equipped with shampoo, conditioner, and body soap. 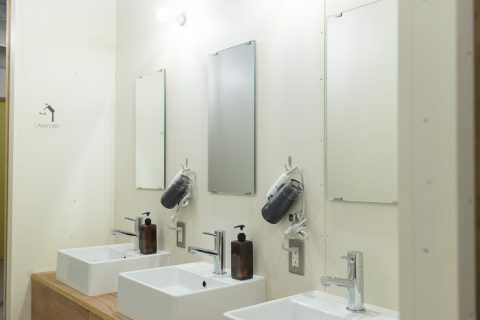 The male shower room and female shower room are located on different floors. 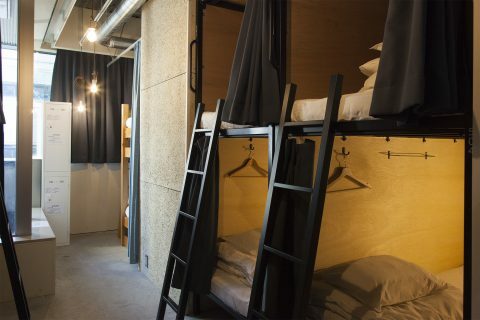 There are towel hangers and small shelves for clothes storage. We have 2 washing machines and dryers on the 5th floor. You may check-out any time by 11am. No check-out process is required to check out! You can leave your luggage with us while the front desk is open (8:00am to 1:00am), free of charge. Please check them in at the front desk, and we will temporarily store them for you. Be sure to be back by the time the front desk closes! We can print out documents for you at 10yen/page (black & white, A4 size). Please email what you want to print out to info@obi-hostel.com, and ask one of the staffs to print it out for you. Please pay when you receive the print out. We would be more than pleased to receive your package for you! -Please let us know the package arrival date and your check-in date beforehand, so we can be aware that a package is coming. You can let us know by emailing us at info@obi-hostel.com. -We start accepting package 2 days prior to your check-in date. -If the package is shipped Cash On Delivery, we cannot accept the package. -If the size of the package is beyond the ordinary (e.g. larger than suitcases), we can not accept the package since we have no place to store it. -We can not deliver the package directly to your rooms, so we ask for guests to come to the front desk to pick up their package. We do not have a curfew, but the door at the entrance will close at midnight for security purposes. Please unlock the night entrance on the left side of the main entrance to enter. Please be considerate of other guests as well as our neighbors when coming back late at night. We have free Wi-Fi access throughout the hostel. We also have 1 computer that are free to use 24 hours in our lounge. We provide free tea in the kitchen area. We also sell coffee, tea, juice, draft beers, bottled beers, sake, plum wine, whiskey, cocktails, and tequila. Please reflainfrom bringing alcohol while the bar on the 1st floor is open. You may bring food and drinks to the first floor but not to the dormitories please.